ST. MEINRAD—When he was a college seminarian, Archbishop Emeritus Daniel M. Buechlein “felt at home” at Saint Meinrad Archabbey in St. Meinrad. That’s how he described in a 2014 interview with The Criterion an essential part of his discernment of religious life in the mid-1950s. He entered Saint Meinrad’s novitiate in 1958, first professed vows as a monk a year later and was ordained a priest in 1964. Pope John Paul II called him away from his home in 1987 to become a bishop. Suffering from a number of health challenges, he returned home to Saint Meinrad in 2011 after retiring from leading the Church in central and southern Indiana. And on Feb. 1, he was laid to rest in the Archabbey Cemetery after the monastic community and many guests thanked God for his life. The rites at Saint Meinrad had begun on the evening of Jan. 31 with a praying of the Office of the Dead, a part of the Liturgy of the Hours. Benedictine Father Justin Duvall, previously the monastery’s archabbot and currently vice rector of Bishop Simon Bruté College Seminary in Indianapolis, gave a remembrance of Archbishop Buechlein during the liturgy. 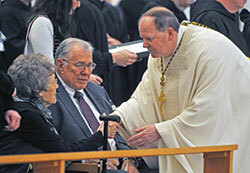 Many rituals accompanied the two days of prayer for Archbishop Buechlein. At different points, the tolling bell in the Archabbey Church of Our Lady of Einseideln slowly rang 58 times, one for each year of Archbishop Buechlein’s life since first professing vows. At other times, all six of the church’s bells rang out joyously in hope of his entrance into the eternal life of heaven. All the rituals, though, were directed toward laying Archbishop Buechlein to rest like all the other monks of Saint Meinrad who have died after a life of fidelity to their vows. Quoting a verse from the Book of Sirach that was proclaimed during the Office of the Dead, Father Justin in closing his remembrance offered a prayer for Archbishop Buechlein. Janis Dopp participated in the rites for Archbishop Buechlein at Saint Meinrad. She now serves as the director of oblates for the monastery. Oblates are lay people affiliated with Saint Meinrad who seek to live out Benedictine values in the world. Dopp appreciated how Archbishop Buechlein emobodied the Benedictine value of prayer as a bishop. “I don’t know if I was ever at a liturgy where he did not stress prayer,” said Dopp, who previously was the director of religious education at St. Charles Borromeo Parish in Bloomington for many years while Archbishop Buechlein led the Church in central and southern Indiana. Dopp also reflected on Archbishop Buechlein’s “ultimate simplicity” in his life as a bishop that was fulfilled in his return to Saint Meinrad. “When he came back here to the monastery, that was sort of like a lived out example of that simplicity of heart that he had that was an abiding quality in everything that he did,” she said. Benedictine Father Anthony Vinson became a monk of Saint Meinrad more than a decade after Archbishop Buechlein left the monastery to become a bishop. A connection between the two was forged in 2005 when Archbishop Buechlein ordained Father Anthony a priest. Their relationship grew even deeper in 2016 when Father Anthony was diagnosed with a brain tumor that has left him deaf in his left ear and partially paralyzed in his face. In the trying months after his diagnosis, Father Anthony, pastor of St. Boniface Parish in Fulda and St. Meinrad Parish in St. Meinrad, visited with Archbishop Buechlein in the monastery’s infirmary. The archbishop, who, among other afflictions, had suffered from cancer and a debilitating stroke, consoled the young priest. He sat for the last time with Archbishop Buechlein on Jan. 24, the day before he died as members of the monastic community kept vigil beside the dying prelate. “It was a very powerful experience sitting with the man who ordained me and holding his hand, knowing that, as Cardinal [John Henry] Newman said, ‘heaven is next door,’ ” Father Anthony said. Archbishop Charles C. Thompson’s relationship with one of his predecessors went back much further than Father Anthony’s. Archbishop Buechlein was the rector of Saint Meinrad Seminary and School of Theology when Archbishop Thompson came there for the first time in 1983 as a seminarian for the Archdiocese of Louisville, Ky.
After Archbishop Thompson was ordained a priest, the two grew in their friendship. He also recalled the words of Pope Francis during a homily last June when the pontiff gave Archbishop Thompson his pallium, a woolen band worn over the shoulders that is symbolic of an archbishop’s pastoral responsibilities and his communion with the pope. “Pope Francis exhorted the new archbishops, ‘Spend your lives for the flock imitating the Good Shepherd who bears you on his shoulders,’ ” Archbishop Thompson said. “… Indeed, Archbishop Daniel spent his life for the flock here at St. Meinrad, in the Diocese of Memphis, the Archdiocese of Indianapolis and beyond. 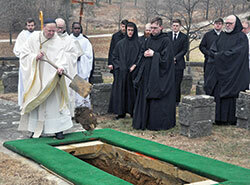 At the end of the Mass, Saint Meinrad seminarians served as pallbearers. The monastic community, with the hoods of their habits worn over their heads as a symbol of mourning, led the slow procession of mourners to the Archabbey Cemetery while carrying candles. After Archabbot Kurt prayed the final prayers of commendation in the cemetery, the pallbearers lowered Archbishop Buechlein’s simple wooden casket—the kind used for all monks—into the ground. 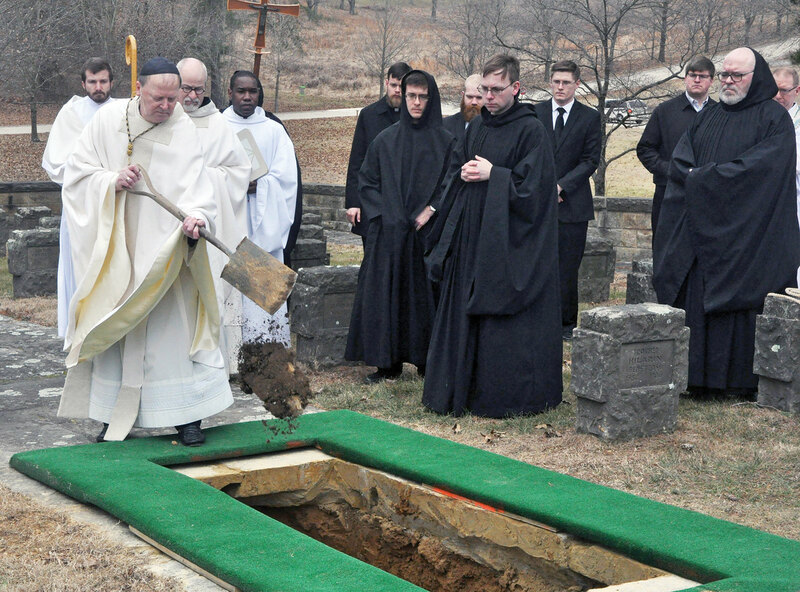 Then Archabbot Kurt, following a tradition of Saint Meinrad, took a spade of dirt and dropped it on the casket, creating a loud thud for all mourners to hear. Then all present were invited to sprinkle holy water on Archbishop Buechlein’s grave. Shortly after the mourners left the cemetery to share a lunch together in the seminary, a cold rain began to fall, which soon turned to snow, covering the grave in a blanket of white, much like the pall that had covered the casket in the Archabbey Church, a symbol of the baptismal garment Archbishop Buechlein received at his baptism in 1938. His brother Charles Buechlein of Jasper, Ind., Charles’ wife Marge, and many of their children and grandchildren attended the rites at Saint Meinrad. He said that they, and the rituals celebrated in Indianapolis, consoled him in his grieving.